ProMat 2019: Meet the Team! Promat 2019 begins in Chicago next week, and our team is on their way to the windy city to meet with hundreds of customers, vendors and friends. Make a point to stop by booth 2441, and you may see one of the familiar faces below! Todd Pippoly is a National Accounts Manager who is attending his first trade show with Millwood! 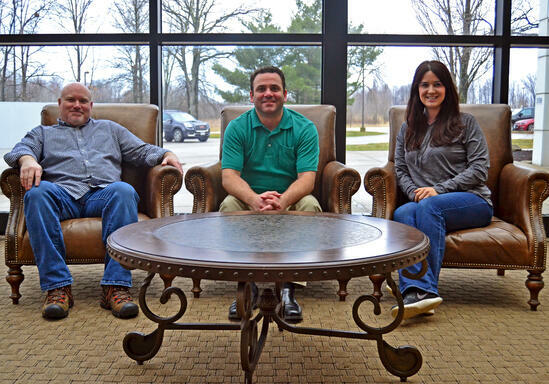 Our other first timers include Erik Leonard, Regional Sales Manager, Dan Procopio, Project Manager of Millwood Logistics and Sarah Drennen, Customer Service Representative. Sarah is the only Customer Service Representative you’ll find in our booth, but if you’re from Southern Ohio, Indiana or West Virginia, she’s the main point of contact and someone we highly recommend getting to know! Erik manages Texas and the gulf coast region, so for those of you visiting from the south, he’s your man. Dan Procopio will be at the booth to talk all your logistics needs (and if you’re lucky, you may even get to hear his infectious laugh), but make sure you get there early - he will only be at the booth on Monday and Tuesday. If you won’t be there those days, don’t worry! That just means you’ll get to visit with Ralph Rupert, our Unit Load Manager. He’ll be helping some students on Thursday, but class is always in session with our resident packaging expert. If it’s the Series 800 stretch wrap system you’re interested in, Rich Evick is the product manager ready to impress you with his wide berth of knowledge. If you already have a wrapper but would like to compare prices for your film, Doug Gaier will be available every day at the show to help you - but as he’s also manager of our sourcing department, you may have to steal him away from someone with a wood products question! We hope to see you there! If you haven't registered yet, what are you waiting for? It's free.